We're excited to be doing our first ever review at Kitchen Floor Crafts. 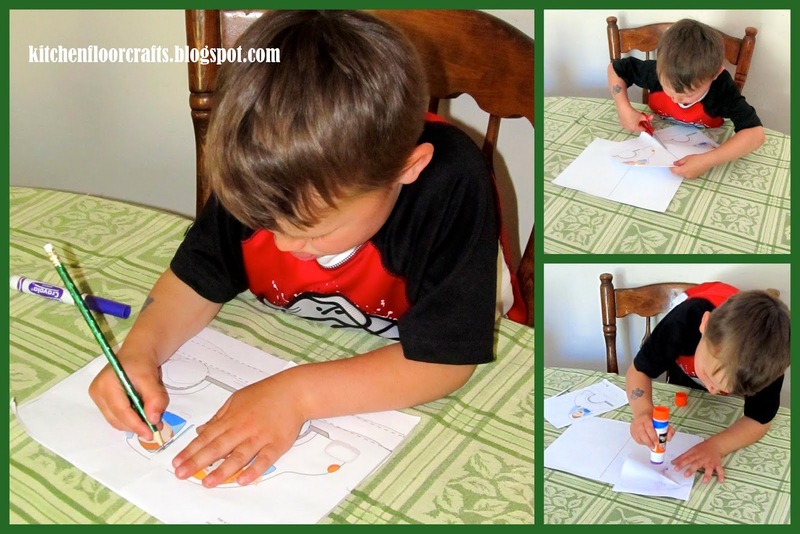 A few weeks ago we had the opportunity to download and try out the Ultimate Art Skills Pack from Totschooling. 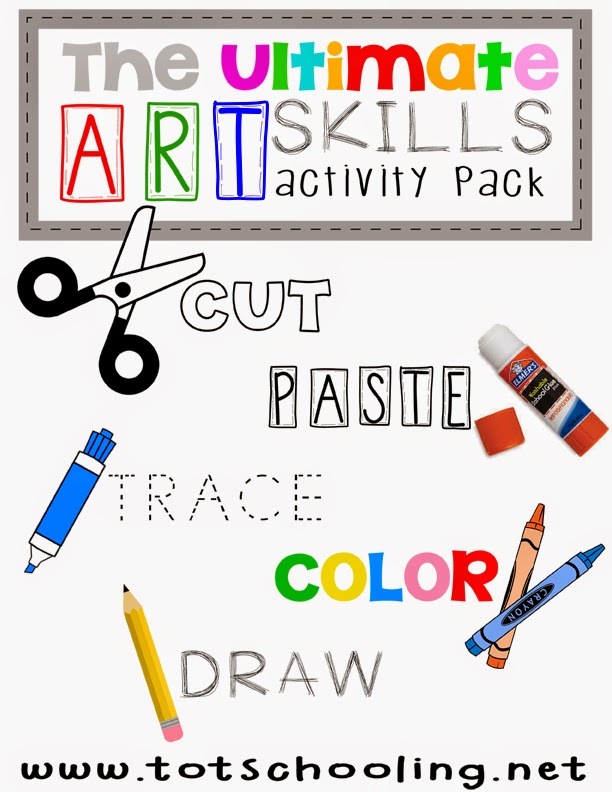 This pack covers five different art skills: cutting, pasting, tracing, drawing, and coloring. The graphics are colorful and fun, and very kid friendly. All of these are skills we use on a regular basis during our crafting, playing and learning, but it's not often we focus on the skills specifically on their own. The pack is set up so that the skills, such as cutting, get harder as you move through the pack. Big Brother helped me print out the packet and quickly became interested in specific pages so we did not do the packet in order. He easily adjusted to the different levels. With younger kiddos it would definitely be helpful to work through it page by page. Each page set gives very clear directions that an adult can read to a child. Most pages involved practicing all five skills on one: first cutting, then pasting, followed by tracing, and ending with coloring and drawing. Big Brother was most engaged with the cutting, and I realized as we worked through several of the pages that we never really have practiced cutting on lines specifically to just practice. We've worked on cutting skills in order to create something, and Big Brother also has a bag of scrap paper he likes to cut up, but it's not often we work on cutting on lines. What was great about this packet was that the lines were not all just straight lines, some were curved and some zig zagged for example. Big Brother's favorite pages were the ones where he had to cut apart the page and then glue it back together into the the correct picture. He loves puzzles, so these pages were right up his alley. Afterwards he would trace the dotted lines and color in the parts, but the cutting was clearly the skill set he was enjoying the most. For us it was a great way to practice all these skills and inspired some more cutting practice with his free cutting paper bag. If you're interested in purchasing the Ultimate Art Skills pack for $4.99 Totschooling has made it easy to purchase the right at their website. While you're there I encourage you to check out some of their other great printables too! Thanks again for the review! I'm so glad he enjoyed it! !